Objectives The mechanism of action of treatment with tumour necrosis factor (TNF) blockers in rheumatoid arthritis (RA) is still not completely understood. The aim of this study was to test if adalimumab treatment could affect the influx of monocytes into the synovium. Methods A novel technique was used to analyse the migration of labelled autologous monocytes before and 14 days after initiation of adalimumab treatment using scintigraphy. CD14 monocytes were isolated from patients with RA, using a positive selection procedure with magnetic-activated cell sorting, and labelled with technetium-99m-hexamethylpropylene-amino-oxime. Scintigraphic scans were made 1, 2 and 3 h after re-infusion. Results As early as 14 days after the start of treatment with adalimumab a significant decrease in disease activity score evaluated in 28 joints was shown. There was no significant decrease in the influx of monocytes into the joint at this time. Conclusions This study indicates that adalimumab treatment does not reduce the influx of monocytes into the synovium early after initiation of treatment. As previous studies showed a rapid decrease in macrophage infiltration after TNF-antibody therapy, which could not be explained by increased cell death, this points to an important role for enhanced efflux of inflammatory cells from the synovium. Monocytes and macrophages are key players in the pathogenesis of RA.9 Furthermore, the decrease in macrophage numbers in the synovium is associated with clinical improvement after effective treatment.10 Therefore, the effect of adalimumab treatment on monocyte migration towards the synovial compartment was examined. The authors recently developed a procedure using a combination of immunomagnetic cell selection with CD14-coated beads, labelling with technetium-99m-hexamethylpropylene-amino-oxime and scintigraphy to visualise the migratory behaviour of autologous monocytes.11 Applying this method, a continuous migration of monocytes into the inflamed synovial tissue of RA patients at a slow macrophage-replacement rate was shown.12 The slow rate of monocyte influx into the synovial compartment suggests that the rapid effect of anti-TNF therapy on macrophage infiltration cannot merely be explained by blockade of cell influx, as previously thought. Hence, this novel imaging technique was used to directly test if adalimumab treatment could affect the influx of monocytes into the synovium. Eight patients with established RA according to the revised American College of Rheumatology criteria for the diagnosis of RA13 were included. All patients had an indication for the use of anti-TNF therapy according to the guidelines of the Dutch Society for Rheumatology, which is active disease status (disease activity score evaluated in 28 joints (DAS28) ≥3.2) despite treatment with two conventional disease-modifying antirheumatic drugs. In this study all patients started with adalimumab (40 mg subcutaneously every other week) 24 h after the baseline scans. Three patients used maximally tolerable methotrexate at a stable dosage (10–25 mg/week). The others received adalimumab monotherapy. The use of concomitant non-steroidal anti-inflammatory drugs was permitted if stable for at least 1 month prior to baseline and was kept stable throughout the study. All patients provided written informed consent and approval was granted by the local medical ethics committee. Isolation and labelling of monocytes was performed as described previously (see supplementary text). Scintigraphy and signal calculations were done as described previously (see supplementary text). This procedure was done at day −14, baseline and day 14. Data were analysed using the Wilcoxon signed ranks test to determine significant changes from baseline. Correlations were calculated using the Spearman's rank correlation coefficient. Values are expressed as median and IQR. The calculations were performed with SPSS 16.0 for Windows. Half of the patients were IgM rheumatoid factor positive and all had erosive disease. Their median age was 53 (48.5–57) years and median disease duration was 162 (119–273) months. Individual patient characteristics are shown in table 1. Scans were made 14 days prior to the start of adalimumab treatment, at baseline and 14 days after the start of adalimumab treatment (see supplementary figure 1). The number of labelled monocytes in the joint of interest per patient was comparable 1, 2 and 3 h after re-infusion. This was true for day −14, baseline and day 14 (see supplementary table). Monocyte influx per patient at 3 h postinfusion is shown in figure 1. Of interest, there was no significant change in monocyte influx 1, 2 and 3 h after re-infusion from day −14 to day 1, which was before the start of adalimumab treatment (p=0.33, p=0.67, p=0.21 respectively). The heterogeneity between patients is consistent with changes in synovial macrophages that were found in serial biopsies of patients treated with placebo.14 Importantly, the influx of monocytes did not decrease after re-infusion of monocytes comparing day 14 to baseline, indicating that adalimumab treatment did not affect the influx of monocytes early after initiation of treatment (figure 1). 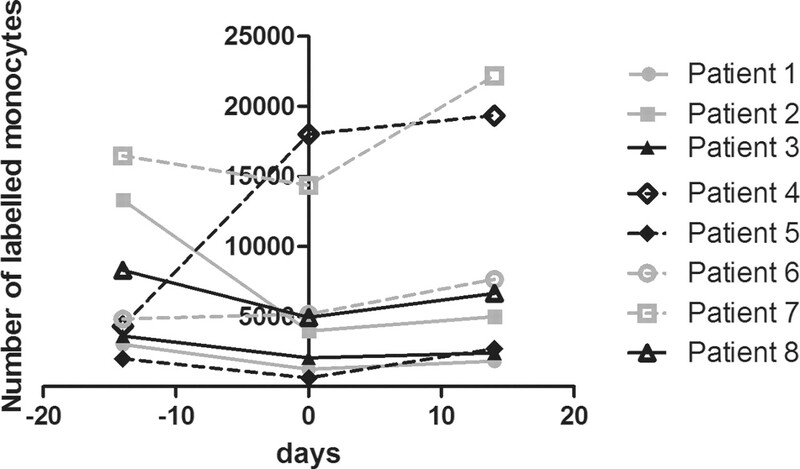 Number of monocytes in joint of interest 3 h post re-infusion per patient at day −14, 1 and 14. The change in DAS28 from screening to day 84 is shown in figure 2. The median DAS28 at baseline was 5.9 (4.8–7.2). The DAS28 did not change significantly between screening and baseline (p=0.58). There was a statistically significant decrease in median DAS28 from baseline to day 14 of 1.2 (0.72–1.8, p=0.01). At day 84 the median DAS28 had decreased to 2.8 (2.5–3.6) (figure 2). Three patients were European League Against Rheumatism (EULAR) moderate responders to treatment and five were EULAR good responders. There was no correlation between the decrease in DAS28, erythrocyte sedimentation rate or C reactive protein and the change in monocyte influx into the joints at 1, 2 or 3 h after re-infusion from baseline to 14 days (see supplementary figure 2). DAS28 from screening to day 84. In conclusion, this study indicates that treatment with adalimumab does not reduce the influx of monocytes into the synovium 2 weeks after the start of treatment. In previous work early reduction in synovial inflammation after TNF blockade could not be explained by apoptosis induction at the site of inflammation. Based on these studies, it is hypothesised that efflux of inflammatory cells is a major contributor to the rapid reduction of cellularity after initiation of anti-TNF antibody therapy. The authors thank the clinical team of the Division of Clinical Immunology and Rheumatology, and Nuclear Medicine and the staff of the Laboratory for Stem Cell Transplantation at Sanquin Research for their assistance.
. Tumor necrosis factor antagonist mechanisms of action: a comprehensive review. Pharmacol Ther 2008;117:244–79.
. Deactivation of endothelium and reduction in angiogenesis in psoriatic skin and synovium by low dose infliximab therapy in combination with stable methotrexate therapy: a prospective single-centre study. Arthritis Res Ther 2004;6:R326–34.
. Decrease in cellularity and expression of adhesion molecules by anti-tumor necrosis factor alpha monoclonal antibody treatment in patients with rheumatoid arthritis. Arthritis Rheum 1996;39:1077–81.
. Reduction of chemokine levels and leukocyte traffic to joints by tumor necrosis factor alpha blockade in patients with rheumatoid arthritis. Arthritis Rheum 2000;43:38–47.
. 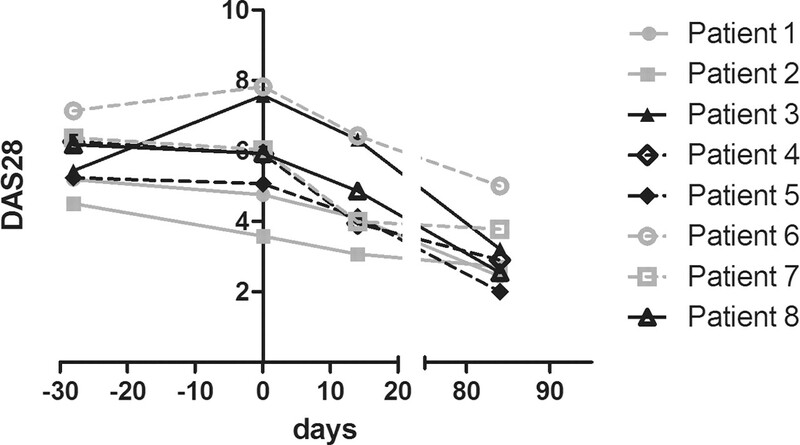 Early effects of tumour necrosis factor alpha blockade on skin and synovial tissue in patients with active psoriasis and psoriatic arthritis. Ann Rheum Dis 2004;63:769–73.
. Tumor necrosis factor alpha blockade reduces the synovial cell infiltrate early after initiation of treatment, but apparently not by induction of apoptosis in synovial tissue. Arthritis Rheum 2003;48:2155–62.
. Neutrophil migration and production of reactive oxygen species during treatment with a fully human anti-tumor necrosis factor-alpha monoclonal antibody in patients with rheumatoid arthritis. J Rheumatol 2003;30:232–7.
. The dynamics of macrophage lineage populations in inflammatory and autoimmune diseases. Arthritis Rheum 2009;60:1210–21.
. Synovial tissue macrophages: a sensitive biomarker for response to treatment in patients with rheumatoid arthritis. Ann Rheum Dis 2005;64:834–8.
. Biodistribution and radiation dosimetry of 99mTc-HMPAO-labeled monocytes in patients with rheumatoid arthritis. J Nucl Med 2008;49:1380–5.
. Monocyte scintigraphy in rheumatoid arthritis: the dynamics of monocyte migration in immune-mediated inflammatory disease. PLoS ONE 2009;4:e7865.
. Effects of oral prednisolone on biomarkers in synovial tissue and clinical improvement in rheumatoid arthritis. Arthritis Rheum 2004;50:3783–91.
. Neutrophil trafficking into inflamed joints in patients with rheumatoid arthritis, and the effects of methylprednisolone. Arthritis Rheum 1996;39:216–25.
. Getting to the site of inflammation: the leukocyte adhesion cascade updated. Nat Rev Immunol 2007;7:678–89.
. Deactivation of vascular endothelium by monoclonal anti-tumor necrosis factor alpha antibody in rheumatoid arthritis. Arthritis Rheum 1996;39:1082–91.
. Vascular cell adhesion molecule 1 (CD106): a multifaceted regulator of joint inflammation. Arthritis Rheum 2001;44:985–94.
. Tumour necrosis factor blockade increases lymphangiogenesis in murine and human arthritic joints. Ann Rheum Dis 2008;67:1610–16.
. Natalizumab for the treatment of multiple sclerosis and Crohn's disease. Ann Pharmacother 2005;39:1833–43.
. Efficacy and safety of efalizumab in patients with moderate-to-severe plaque psoriasis resistant to previous anti-psoriatic treatment: results of a multicentre, open-label, phase IIIb/IV trial. Arch Drug Inf 2010;3:9–18. Funding This study was funded by Millennium: The Takeda Oncology Company. Competing interests Millennium: The Takeda Oncology Company participated in the design of the study, monitored the clinical study and participated in the analysis and interpretation of the clinical study. Ethics approval This study was conducted with the approval of the Academic Medical Center/University of Amsterdam.